by Crenshaw Sepulveda on 7/23/2010 @ 3:04pm Meh. It violates the general theory of CPTED: Crime Prevention through environmental design. The wall leaves a space on the staircase hidden from people walking up the stairs making the stairs unsafe and perceived as unsafe. Many people tried to talk the designers out of this this last minute change but failed. Stairs are an improvement to the old design but unfortunately leave some of the old curse from the prior design in being unsafe. The prior designers of the stairs had a fetish with plants, planters and hidden spaces and with moving escalators which left many victims and pathway largely unused after dark. Now safety has been greatly compromised to erect and "Art Wall" to presumably satisfy the 1 percent requirement. This could have been avoided if the art wall was place on the side of the staircase but the current design creates a huge blind spot for potential pedestrians. Using basic CPTED principles, the length of the walkway must be easily viewable from both Commerce and Pacific Avenue. Blind spots and hidden alcoves should be eliminated. See drawing by architect Ko Wibowo from McGranahan Architects. The pathway from Pacific Avenue to Commerce must first be opened up, removing the blind corners and hidden alcoves permitting easy surveillance for pedestrians from both streets. The new pathway could be augmented by planters, art and decorative design features so long as they do not obscure the view of the pathways from either Commerce or Pacific Avenue. that or a sweet new place to wheatpaste. The back spot is vulnerable. In fact it had graffiti before the construction started. by ixia on 7/23/2010 @ 10:58pm Anybody have an urban design 101 book for loan to the city?? The whole thing lacks a plan. Looks like an absolute afterthought. What really get's me is that the AG's office is burning an extra half million bucks a year on higher rent, while leaving yet more downtown office vacancy behind. How Putnam ever managed to get retail turned into office space is disturbing, if not corrupt. by Crenshaw Sepulveda on 7/24/2010 @ 12:57am I think the whole stairway is begging for some graffiti. Do graffiti artists really like putting their work in hidden places? Good perspective on the stairs, however. Reminds me of the Odessa Steps in the Battleship Potemkin. I've got to agree ixia. There's so much about the way Tacoma "works" that people don't know about and will never know about. I think someone involved with this project caused the city to order the demolition of the Luzon but we'll probably never know. Quite likely somebody gave the order to demo our wonderful old landmark over coffee or a martini. by L.S.Erhardt on 7/24/2010 @ 10:29am I Tell ya, Pac Plaza seems the kinda place that Apple store in the mall should've gone. by Crenshaw Sepulveda on 7/24/2010 @ 10:58am Why does Thorax hate Apple? by KevinFreitas on 7/24/2010 @ 11:01am @Thorax: absolutely but, unfortunately, fat chance. Unless the mall met some kind of catastrophic demise downtown retail will likely mostly be relegated to independent businesses. I sincerely hope some murals or something will be done to help fill that space in. That art wall looks like a graffiti magnet not to mention all the bare cement all over. *Sigh* c'mon Tacoma, do better! Demand better! See the Foss Hotel, Luzon, Tollefson Plaza... Find a loophole in local law to demand what we deserve. Julie Anderson did it via a previously agreed to lien to block the WSHM donor wall so at the very least we can still see through the fence to the bridge. Don't just use bureaucracy as a preventer but use it also as a wedge to open up opportunity to get what we deserve in this town. by TDI-Reporters-Notebook on 7/24/2010 @ 1:24pm here are some links to what that 12th street hill climb / art wall area is supposed to look like when finished . . .
by Non Sequitur on 7/25/2010 @ 9:48pm That is both ugly and not human-friendly. Apparently, this was designed by a Seattle Firm as a way to further quash T Town's potential and in turn, elevate S Town. The conspiracy runs deep, with many levels not at all unlike an onion of malice. by NineInchNachos on 7/25/2010 @ 10:20pm great post, thanks todd! by Dave_L on 7/26/2010 @ 12:47am With all due respect to the artist, I would rather have seen the hex-tile in the Luzon. "...it refers to the remarkable transformation of a former Turkish bath into a cistern..."
Something about that statement is just insane. by NineInchNachos on 7/26/2010 @ 7:00pm anyone catch the latest tacoma spaceworks cultural arts improvement to 9th and pacific? by NineInchNachos on 7/26/2010 @ 7:01pm arise? I'd say that's a valuable community message. 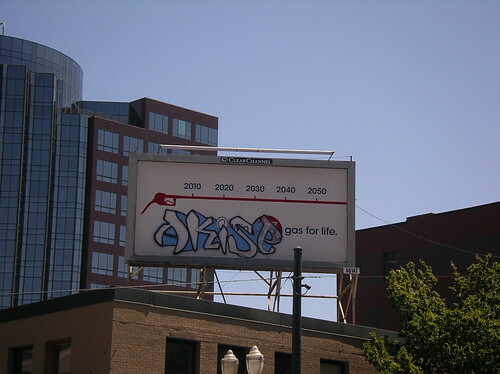 "gas for life!" by L.S.Erhardt on 7/26/2010 @ 7:36pm Uh oh uh oh! by jenyum on 7/26/2010 @ 10:46pm That is just infuriating. Did it not occur to anyone during the planning process that people walking the stairs would not be looking at the artwork as if from a hot air balloon suspended over the corner? From a street level perspective it's like the artist is trying to slap the pedestrian for contemplating taking those stairs. There weren't any design proposals that didn't block the sight lines? There weren't any design proposals that didn't specifically go out of their way to block the sight lines? Do downtown office workers get their own personal invisible hot air balloons with which to enjoy the fine public art? When do we get the Orcryx and Joe strip?